« We interrupt your irregularly-scheduled blogging to stump for a good cause. I think it’s time we all acknowledge that I am the worst book blogger ever. I’m okay with that, because this is just a hobby, and I know a lot of my reviews are pretty squee-full because I only read books I think I’ll like and really only bother to write about things I love and want to share. And I only do that once every six months or so. Whoops! But rather than heading into 2013 staring at the books I’ve read, trying to remember enough to write full reviews, here are a slew of mini-reviews of stuff I read in 2012 and never got around to writing about. In three paragraphs or less each, I’ll be covering Bitterblue by Kristin Cashore, Cinder by Marissa Meyer, The Demon’s Surrender by Sarah Rees Brennan, and Team Human by Sarah Rees Brennan and Justine Larbalestier. I think this was my favorite of Cashore’s trilogy (though I probably ought to reread Graceling under less frantic circumstances), though it still had its ups and downs for me. While I felt like Bitterblue was better in terms of plot than Fire, it still felt a little slow. It was, essentially, a mystery rather than action-adventure, but I didn’t feel like there was really enough to the mystery to justify how long it took to get things figured out. On the other hand, I was fascinated by all of the cyphers and puzzles there were to ponder, even as things moved slowly. One other random note that had me bemused throughout the whole series: Katsa and her merry men gang of friends have this Council going that subverts bad monarchs and helps free people. But it’s already in progress when we meet her in Graceling, and it continues its work throughout Bitterblue — but we never actually see much of it. Especially not in Bitterblue. It feels like the Council could be a series of novels in and of itself, and having it occasionally mentioned in the background is a lot like having a series about the adventures of some lady who lives a couple of townships over from Sherwood, whose buddies occasionally let her know what Robin Hood is up to. 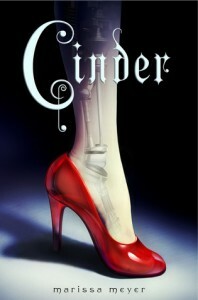 This book is a sci-fi take on Cinderella, and I think it did itself a huge favor by using Cinderella as a basis and inspiration, but not forcing itself fully into the same plot and structure as the original fairy tale. That gave the narrative a lot of freedom to do more and build around the fairytale than I was expecting. As for the sci-fi aspect, weirdly, I am totally able to suspend my disbelief for the idea of cyborgs, but still never quite bought into the “humans moved to the moon and developed creepy superpowers” aspect of it. The two pieces didn’t feel like they ever quite meshed. I liked Cinder as a character, and I thought the prince was pretty dreamy, but as someone who isn’t a shippy reader in the first place, their romance seemed to come out of nowhere pretty quickly (they only met a few times before he had feelings for her, and I wasn’t sure where they’d come from). I also called the big twist ending and a few of the other plot points early on — which isn’t really a problem, since it was still a really enjoyable read, but it dulled the shine on the big reveal. One thing I will say, though, is I’m intrigued by how much the use of mirrors cropped up in this. Mirrors aren’t usually Cinderella’s thing, and it makes me wonder if future books might explore other fairy tales a bit. Overall, this book was solid. It definitely read like a debut, a little bit rough in some ways, but I’m definitely looking forward to the rest of the series. Three and a half cupcakes. 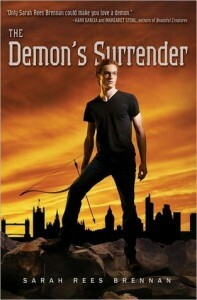 In the last year or so, Sarah Rees Brennan has snatched up the title of my favorite YA writer, and I think The Demon’s Surrender is my favorite book of this trilogy. That’s probably because the narrator, Sin, is my favorite of the three narrators, and also because I am way more shippy about Sin and Alan than I ever was about Mae and Nick. I can’t say I loved every aspect of the book, but overall I liked this series much more than I expected to (urban fantasy is not my favorite) — it was incredibly compelling. And it makes me wonder if maybe Ms. Brennan reads this blog, because in my review of the first book I said the narrator didn’t work for me and I wished someone else would get the POV in book two — and it happened; and in my review of the second book I asked why Mae and Sin had to be set up as rivals — and this book was actually explicitly about the expectation that women will be rivals instead of friends, and how the two of them navigate that to work together despite it all. So definite kudos on that front, too. There’s a lot to enjoy about the series: awesome ladies, queer characters, the dark and broody boy (if that’s your thing) and the charming liar boy (which is definitely my thing) and the relationships between all of them. The characters stood out to me much more than the plot, and I wasn’t totally satisfied with the “who will run the Market?” storyline’s resolution, but the characters and the very compelling prose are definitely enough to give this a solid four cupcakes. I really enjoyed this book, which should come as no shock, since long-time readers may remember that Justine Larbalestier has long been of my favorite YA writers and, like I said above, Sarah Rees Brennan is a new favorite. So the two of them teaming up to write a vampire parody novel? Yes, please. The book takes on a lot of vampire novel tropes — it features a brooding (though not sparkling) vampire who’s in love with a much younger mortal; said mortal is Cathy, a teenage girl who finds the whole concept of vampirism romantic and beautiful. But the protagonist is her best friend Mel, who finds the undead thing pretty ridiculous and has no patience for Cathy’s infatuation, and is determined to save her friend from herself before she can make the terrible choice to become a vampire. So, in other words, a protagonist who responds to the vampire thing like a lot of readers with Twilight fatigue do. The book is entertaining above all else — there’s not much to it, plot-wise, but it was a really fun read that managed to poke fun at the vampire craze (particularly Twilight) without being nasty or dismissive of the young women who love it. That’s a hard balance to hit, but I will always like fond parody so much more than nasty parody, and that’s why this book worked. Three cupcakes. This entry was posted on Sunday, January 6th, 2013 at 11:52 am and is filed under 3 Cupcakes, 3.5 Cupcakes, 4 Cupcakes, Contemporary/Urban Fantasy, Fairy Tale/Mythic, High Fantasy, Humor. You can follow any responses to this entry through the RSS 2.0 feed. You can leave a response, or trackback from your own site. 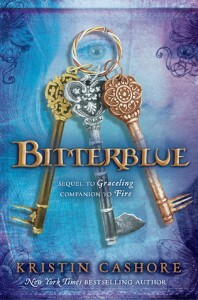 I had to skip the review of Bitterblue, because I haven’t read it yet and I have very high hopes for it and, in fact, I’m requesting it from the library right now. And Team Human looks delightful, and confirmation that it mocks Twilight without mocking young women is a relief. Onto the list it goes!